The global village shelter is an easy to assemble housing system that can be rapidly deployed after an emergency. 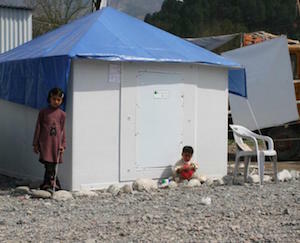 The Shelters are available in 6 and 20 meter sizes and are shipped flat. They are made entirely of plastic and can be assembled by two people in 15-20 minutes. They have an optional wood stove and can be connected to each other to form larger structures. The shelters are manufatured by Global Village shelters LLC. They are shipped direct by the container load.